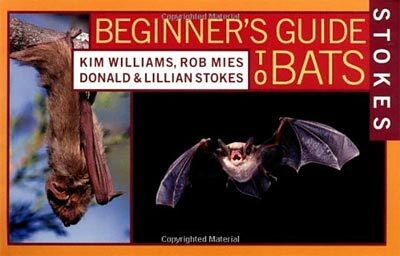 The Stokes Beginner's Guide to Bats is intended for beginning nature lovers of all ages. The guide offers a wealth of identification and behavior information in a portable pocket-size format. Illustrated throughout with full-color photographs and range maps, this guide includes information on breeding, feeding, roosting, migration, and hibernation for all 45 species of bats in North America. With the Stokes' easy-to-use and popular color-tab system, become an expert on bat habitat, biology, food preferences, and even how to build a bat house. A quick and easy reference section gives a list of bats found in each state or territory of the United States and Canada. Complete with a great how-to section on attracting bats, Stokes Beginner's Guide to Bats provides everything you need to know to attract these flying wonders to your backyard sanctuary. Details: 160 pages, paperback, 4.5" x 7"